At this location a religious ceremony is performed by Hindus, who are primarily Balinese. They perform the MEMENDAK THIRTHA ceremony and the MJEJAUMAN ceremony on Mount Semeru. The annual ceremonies are conducted in July. Balinese traditional dances are performed as part of those ceremonies. 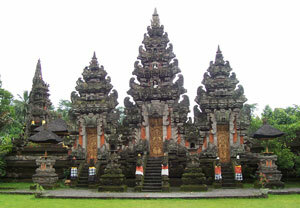 The temple is in located Sendoro district, about 25 km west of Lumajang. Mandara Giri Temple is one of religious tourims in Lumajang that often visited by many pilgrimage. This great temple also save Lumajang history in the past. Visit this unique temple in Lumajang Regency and watch its special ceremony.